We traveled through southern Laos faster than we’d planned so we could meet up with our friend Brendan, whose visiting from D.C. for a few days. But on our way to Siem Reap, Cambodia we did break up the trip a couple of times. 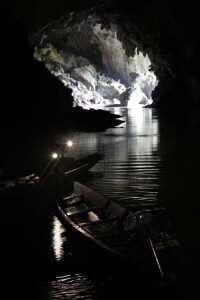 One overnight stop was in the village of Kung Lo to see their cave. Yes, that’s right, their cave. A small river cut the cave that’s about 4 miles (7km) long under mountains of solid slate. 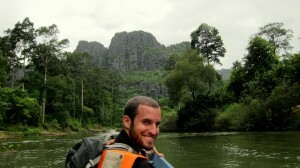 We took a little dugout canoe with a small engine on the back, that carried us, the boatman and a guide. Armed with strong headlamps, in we went against the flow of the river. There were silty beaches with fine dark sand from the rock. And stalactites and stalagmites so intricate they remind me of church organs in the grandest of cathedrals. And at points we couldn’t see the ceiling it was so far away. It was huge. So big the banks and ground could have held a small town — aside from the total lack of sunlight that is. Oh so dark. Many times the light from our headlamps couldn’t reach the rock above or to the side of us. Just blackness for 4 miles. And the only sound to be heard came from our small engine. Spooky. It reminded me of the Caves of Moria from Lord of the Rings. I kept looking for the goblins to come running out from around the corner. 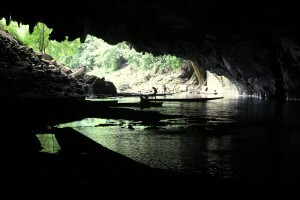 When we reached the mouth of the cave on the other side we braced for the light. I’m sure the only thing that normally comes out of this cave are bats and fish. We took a break on the riverbank and then turned around and went back through, this time with the flow of the river. Hoping that again we’d be spared from the goblins. We were. 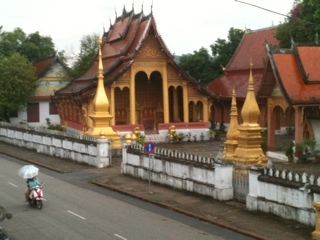 And are now in Cambodia. Brendan arrives tomorrow.